Get ready for a brand-new season of Top Chef! Season 15 will take place in Colorado, and it will land on Bravo on December 7. Bravo revealed more about the return of the series in a press release. Check that out below. “Bravo Media’s Top Chef embarks on an epic culinary adventure through the state of Colorado for season 15, kicking off with three weeks of supersized premieres beginning Thursday, December 7 from 10 – 11:15 pm ET/PT. The Emmy and James Beard Award-winning series will follow 15 diverse chefs from across the country as they battle it out for the coveted title amid the breathtaking landscapes and thriving culinary scenes in Denver, Boulder, Telluride and Aspen. Host Padma Lakshmi, head judge Tom Colicchio return to the judges table alongside Gail Simmons and Graham Elliot. BravoTV.com’s Emmy-Winning Digital Companion Video Series “Top Chef: Last Chance Kitchen” returns for season seven with unprecedented twists and turns, and for the first time ever will launch before the season begins on Thursday, November 30. Sponsored by Hidden Valley(R) and hosted by Tom Colicchio, cheftestants face-off in a pressure-filled head-to-head battle for the ultimate prize – redemption and a spot in back in the competition. The digital series will be available on BravoTV.com, Bravo Now, VOD and YouTube. *For more information on the cheftestants, please visit Bravotv.com/top-chef. For season 15, the competition reaches new heights as the chefs battle it out on an epicurean road trip through Colorado, traveling to Denver, Boulder, Telluride and Aspen. From deconstructing the Denver Omelet and preparing Rocky Mountain Oysters to tailgating with the Broncos, the level of competition for these 15 talented chefs is going to be a mile high. With the judges looking for the chefs’ peak performances, the challenges will test the competitors’ culinary abilities in picturesque locales including a food festival in Larimer Square, a blizzard infused campfire cook-off, and cauldron cooking at the FOOD & WINE Classic in Aspen. In addition, social media star Logan Paul heads to Boulder and Olympians Gus Kenworthy, Meryl Davis and John Daly will challenge the chefs in an all-around culinary competition focusing on speed, precision and freestyle. And not to be outdone, Top Chef season 14 winner Brooke Williamson returns to surprise the cheftestants with a breakfast Quickfire using Nutella(R). It’s not going to be easy for these chefs as they go for the gold, traveling around the state in BMW X5 xDrive50i, and battle it out for $125,000 furnished by S.Pellegrino(R) Sparkling Natural Mineral Water, a feature in FOOD & WINE magazine, a showcase at the annual FOOD & WINE Classic in Aspen and the coveted title of Top Chef. Throughout the season, the chefs will be tasked with serving up food for culinary stars including: Curtis Stone (Head Judge of “Top Chef Jr.”), Naomi Pomeroy, Richard Blais (“Top Chef: All-Stars” Winner), John Besh, Bruce and Eric Bromberg, David Kinch, Adam Perry Lang, Johnny Iuzzini, Wylie Dufresne, Paul Liebrandt, Michael Voltaggio (“Top Chef” Season Six Winner), Bryan Voltaggio (“Top Chef Masters” Finalist), Chris Cosentino (“Top Chef Masters” Season Four Winner) and Nilou Motamed. Also lending their expertise are local Colorado greats Troy Guard, Alex Seidel, Hosea Rosenberg (“Top Chef” Season Five Winner), Lachlan MacKinnon-Patterson, Keegan Gerhard, Jen Jasinski (“Top Chef Masters” Finalist) and Frank Bonanno. Towards the end of the season, the cheftestants will also have the opportunity to vie for the “Top Chef Fan Favorite” title, voted upon by viewers on BravoTV.com. The winner will be announced on the finale night on “Watch What Happens Live with Andy Cohen” and will receive $10,000 furnished by S.Pellegrino(R) Sparkling Natural Mineral Water. Fans and foodies alike can join in the #TopChef social conversation by following @bravotopchef on Twitter and Instagram, and by liking the Top Chef Facebook page. 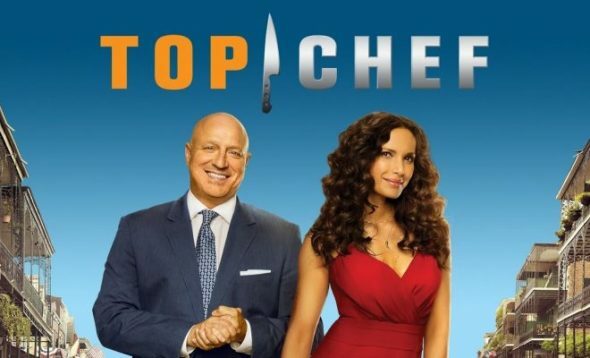 “Top Chef” can be seen on desktop, mobile and tablet at BravoTV.com, on the Bravo Now app for iPhone, Android, Apple TV, Amazon Fire, Xbox One and Roku, as well as iTunes, Amazon, Hulu and VOD. Top Chef ranks as the number one food show on cable among P25-54 in 1Q17, with season 14 delivering 2.1 million total viewers, up 3% from the prior season (Nielsen L7). Are you a fan of Top Chef? Will you watch season 15? Check out the trailer below, and tell us what you think. More about: Bravo TV shows: canceled or renewed?, Top Chef, Top Chef: canceled or renewed? The Gifted: Cancelled by FOX; Could Season Three Happen on Disney?